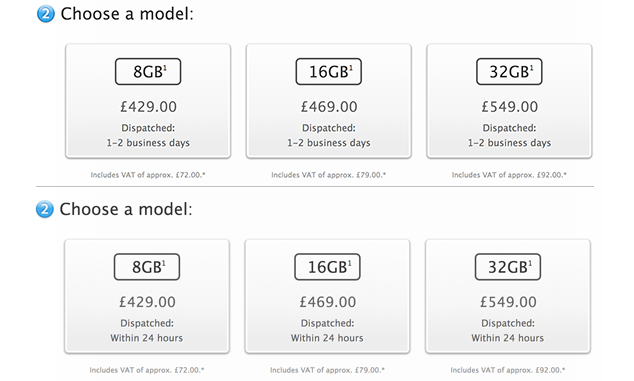 Apple's UK Online Store page for the iPhone 5c now shows 1-2 day delivery (top) compared to Apr. 16. First spotted by Portuguese blog All Mac Long, the shipping delays are being seen in nearly all European countries in which the Online Apple Store operates. With current delivery times quoted at one to two days for nearly all products, including Apple's own equipment, the modification is likely a reflection of regional warehouse or courier companies' Easter weekend schedules, not Apple's European product channel inventory. AppleInsider was able to confirm that Apple's new shipment protocol was adjusted within the past two days. While the countries listed above may not be promised a quick one-day turnaround on Internet orders, Apple is continuing to offer the 24-hour availability in other parts of the world including the U.S. and Canada.